For New Englanders like me, Spring means three things - golf, despair over the Red Sox’s starting rotation, and college graduation season. A new crop of sales talent is readying to enter the market and nearly all of my clients have open headcount for Sales Development Reps. And, I can assure you, most are facing a very competitive hiring market. If you’re looking to attract the class of 2016, you have to be creative. It should come as no surprise that 90% of those under the age of 30 use social media. What you may not know is that Instagram’s usage has surpassed Twitter’s – registering 400M monthly active users. If you are looking to drive candidates to your positions, you need to fish where your potential candidates swim. the Instagram pond is fully stocked. The platform is a tremendous recruiting channel. If you can target them on Facebook, you can target them on Instagram, too. That means by city, region, school, interests, etc. There are three keys to successful Instagram recruiting. Let’s say you are hiring in downtown Boston and are looking for 2016 grads. You’ll want to dial in your location, radius, and age preferences. Next, think about where your best candidates have historically come from. Identify your top 3-5 feeder schools. This is the most important aspect of your campaign. Think about who you’re targeting. What can you do to catch their eye? Some employers go the branding route and feature their companies. While other spotlight members of their team. I highly recommend you focus on school-specific targeting. Consider having an employee (bonus points for an alumnus) stand in front of your company logo while wearing College/University gear. Our friends at QuotaFactory were kind enough to help me mock up an example. 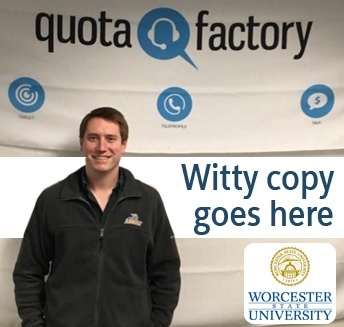 The caption might have read: Worcester State grads love working at QuotaFactory! Jumpstart your career in Sales & Marketing. Someone wise once said Clarity trumps persuasion. On Instagram, fun, hashtags, puns, etc. are appropriate. But not at the expense of your copy. You want to be crystal clear with your call to action. Have a direct link to the job description, not your general careers page. Getting the candidate to your site is good, but having something appealing that catches their eye and makes them want to apply is key. Exposure is great, but you want applicants. Last week, what Trish wrote about writing great job descriptions is worth another read. Here is a video example from DemandDrive featuring Boston College alum Jon Huang: https://www.instagram.com/p/1lYFrYFGAP/. I would have done a few things differently, but I hope you can see the potential. National Public Radio's NPRInterns are also doing great things. To get started, brainstorm with your team and pull in your marketing group. Highlight your people and you’ll be well ahead of the curve. If you have any success / experiences to share, please let me know in the comments below.